Nowadays, the competition in the digital marketing landscape is getting tighter. Brands of all shapes and sizes are fighting for a better search rank. As a marketer, leveraging social media and SEO together can give you a competitive edge. Both are organic, inbound strategies that focus on building a brand’s identity through providing content. When used together, they have the power to strengthen your brand’s visibility. But how exactly do they affect each other? In 2014, Google’s Matt Cutts clarified that social signals such as Facebook likes and retweets do not affect search rankings. They might not affect your search rank, but links published on social media can be considered as credible backlinks. Backlinks are also known as inbound or incoming links. They are important for your SEO campaign. Search engines, especially Google, give more credit to websites that have a good number of quality backlinks. In short, the more backlinks you get, the more relevant you appear to search engines. This can benefit your domain authority as well, which is also a search engine ranking factor. Your social profiles influence the content of your search results. When people search for your brand, your brand’s social media accounts will appear in search listings. For example, we tried to search for NextStep Hub. 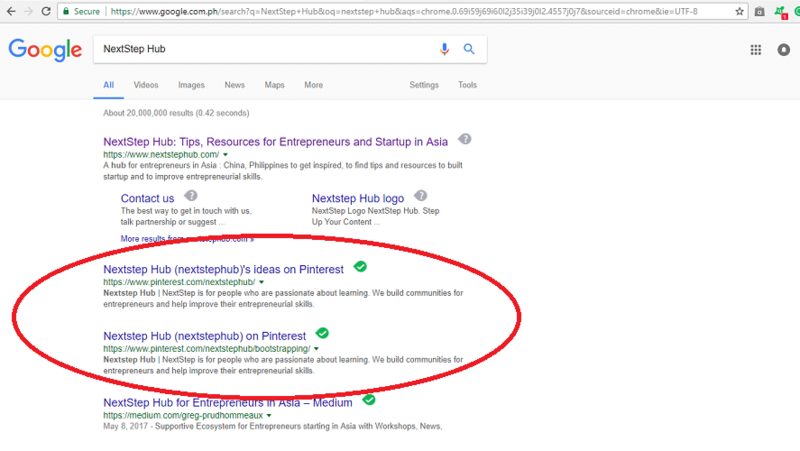 Google didn’t only show our website, but even our Pinterest account. In addition, Google has a partnership with Twitter. And sometimes, relevant tweets appear on search results. 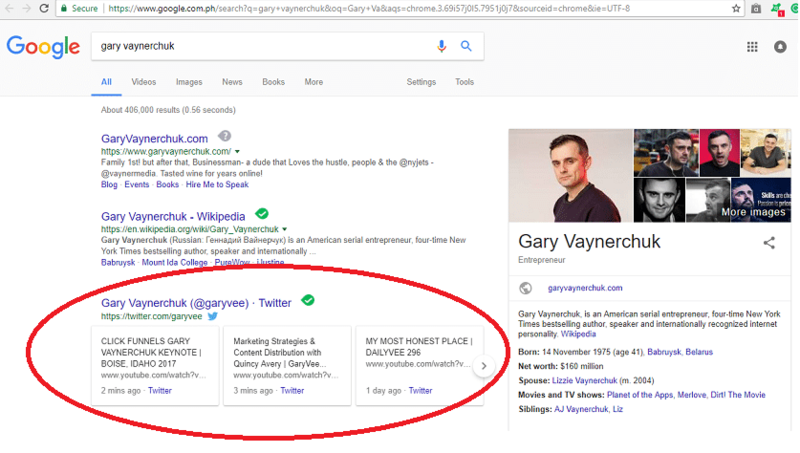 Take a look at the results when we searched for Gary Vaynerchuk on Google. As you can see, his recent tweets showed up. People don’t only use Google or Bing to search. They also turn to social media to find the trends and topics they are looking for. In fact, Youtube processes more than 3 billion searches a month, while Facebook sees 2 billion searches per day. Because of this, you should also apply your SEO strategy on social search engines. The more optimized your posts are, the easier people can find you. Social media is the easiest and most effective way to drive visitors to your site. Though likes or retweets don’t directly influence your ranking, the incoming links from your social media shares can affect your website’s bounce rate and engagement. If people read your content and leave comments on your website, those engagements communicate value to search engines. Social media platforms provide detailed reports and analytics of your posts’ performance. By studying these, you can determine what type of content sells. Simply put, sharing on social media is a great and effective way to know your target audience. If you know what they want to see, you’ll be able to deliver useful content. There are many experts and top industry sites on social media, especially on LinkedIn. These influential people run blogs that earn millions of visitors. If your content reaches these high-profile sites, you’ll get backlinks. So how would you get your content in front of those influencers and experts? Mention them in your post when you feature them in your content. For example, you wrote an article about digital marketing tips from marketing experts. You can search for their popular and relevant quotes or tips, then include them in your content. After that, mention them when you share your article on social. If your post is good enough for them, you might get a link from your target influencers. We mentioned earlier that social media accounts often appear in Google’s search results. If your social media profiles aren’t optimized, they might not show up when people search for keywords that are related to your site. Always make sure that your social profiles are consistent with your website. As much as possible, use the same logo or picture. Add relevant keywords in your bio, and don’t forget to include the link to your official website. Also, check your Facebook page and see if it’s optimized for visibility. Simply go to the general setting on your page and ensure that your updates and posts are visible to everyone. Follower counts don’t directly influence your search rankings because Google can’t scan them. Matt Cutts made it clear that Google isn’t always able to crawl all of the pages on Facebook and Twitter. Because of this, they miss some data, including the number of followers an account has. Instead of focusing on your follower growth, make sure your content reaches the right audience. When your posts are relevant to your followers, they’ll share it. This alone can generate new leads. So say no to buying proxy followers just for the sake of numbers. Don’t forget the impact of CTA as well. Tell your audience what you want them to do. Ask them to share your post, retweet your tweet, or leave comments. At the end of the day, it all boils down to the quality of your content. People will only share your post if it’s actionable and valuable. Make sure to spice up your content by adding compelling images, GIFs, and videos. Like what we always say, “Content is King”. If it’s not share-worthy, it won’t give you traffic, shares, and links. Always offer well-written and valuable content that provides authority on your field. Social media and SEO is truly the peanut butter and jelly of digital marketing. Together, they maximize the reach and effectiveness of your content and strategy. An active social presence combined with great network building and optimized website can step up your content marketing game. They won’t only bring traffic to your sites. They will also help you build your brand’s reputation, develop trust and authority, and improve your customer service. 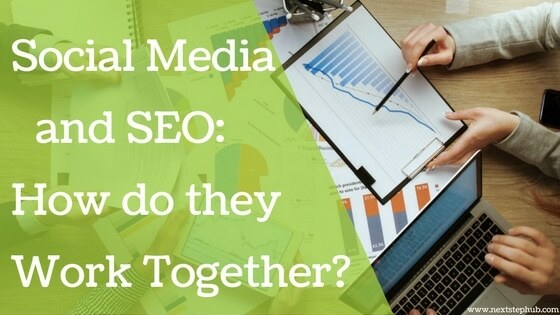 How do you utilize social media and SEO together? Tell us in the comments!